Paul Thek - "Untitled" - 1966-67, from the series Technological Reliquaries. Paul Thek - "Meat" - 1964 - from the 1966-67 series Technological Reliquaries. 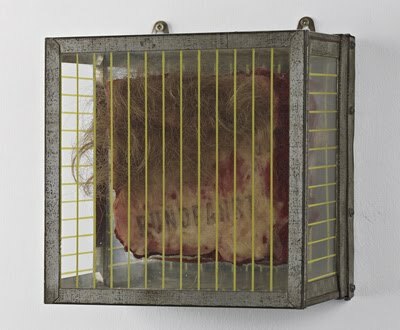 In the mid-1960s, Paul Thek began a group of artworks that presented meat in vitrines. 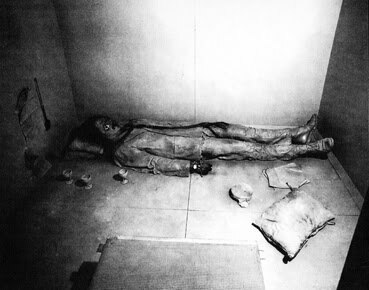 He followed these sculptures with ones utilizing casts of his body parts. Both sets of works he called Technological Reliquaries. These works were a direct critic of the commercialism and the cool detachment of Minimalist and Pop Art, movements that removed the visible hand of the artist. Thek was also protesting the U.S. involvement in Vietnam. 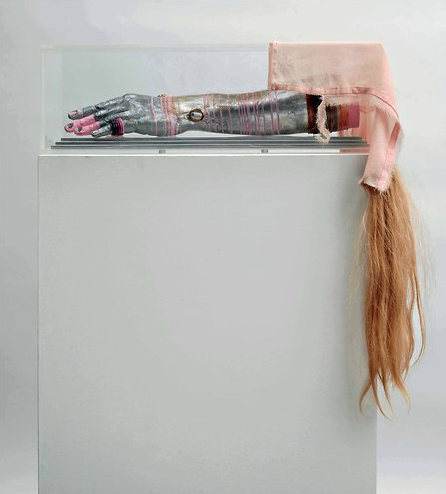 Enshrining his work in reliquaries, objects designed to hold and make precious, sacred objects, Thek used both the literal entropy of meat and the suggested decay of the body to ask viewers to contemplate the fragility of life that is our shared human experience. The piece he was to be most infamous for was his 1967 sculpture The Tomb (later refered to as Death of a Hippie by critics), a life-sized effigy of the artist laid to rest in a pink ziggurat. 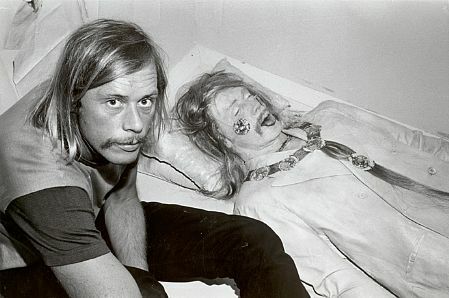 A full-size cast of his body lies entombed dressed in a suit jacket and jeans, painted a pale pink, and adorned with jewelry made of human hair and gold. In 1979, Thek wrote to a priest, "I am OK, still trying to be 'an artist' in the secular world . . . as you know, the world is the world, very 'worldly,' etc., etc." Paul Thek: Diver, a retrospective which opened at the Whitney Museum of American Art, New York in October 2010, was on view at the Hammer Museum, Los Angeles until September 4, 2011. Hujar's images of Paul Thek's The Tomb are featured in the exhibition Influential Friends by Peter Hujar November 1 – December 10, 2011 at John Mc Whinnie @ GBH Gallery in NYC.